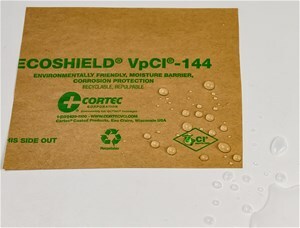 Cortec VpCI-144 paper is coated with a water-based barrier coating. It is the premium corrosion inhibiting paper in the industry. Historically, polyethylene and wax coatings have been used to seal porous paper to provide a moisture barrier and/or moisture-vapor barrier. When coated this way the resulting paper product is an environmental problem and cannot be recycled through normal channels. Cortec VpCI-144 paper provides an environmentally friendly alternative to polyethylene and wax paper. The patented Vapor phase Corrosion Inhibiting technology has revolutionized the way metals are protected in an enclosed package. Cortec VpCI-144 paper provides superior corrosion protection for both ferrous and non-ferrous metals. Cortec VpCI-144 is environmentally safe, non-toxic, biodegradable, and fully recyclable/repulpable. That means VpCI-144 can be recycled into other types of paper products such as boxes, cardboard, and other corrugated materials. It also means that Cortec VpCI-144 can be "repulped" or made into or mixed with pulp to make new paper products. Cortec VpCI-144 paper is made from the highest quality recycled neutral natural kraft paper: our paper is made without the use of any chlorine or other bleaching chemicals. This eliminates package contamination found with other competing VCI/VPI papers. Parts protected with Cortec VpCI-144 can be painted, welded and soldered. The thin protective film doesn't influence physical properties of most sensitive electrical and electronic components, including conductiviy and resistiviy. The paper basestock for the VCI/VPI coatings is produced with closely packaed cellulose fibers which for a relatively non-permeable sheet. This attribute produces a uniform coating, as well as prevents the coating from striking through the paper. Cortec VpCI-144 paper can be used to protect products for storage and shipment in a variety of ways: end closures for shipping tubes, insert strips for recessed areas in large packages; and as sheet liners or separators between products. Metal production: coils, wire reels, plate, bar, etc. Metal forgings and die castings: raw and machined forging and castings. Metalworking: stamping, sheet metal work, springs, bearings, fasteners, tube, pipe, jewelry, silverware, etc. Finished products: engines, machinery, equipment, tools, hardward, appliances, instruments, motors, etc. Electrical and electronic: components, controls, printed circuit boards, etc. Biodegradable. Contains no nitrites, phosphates, silicones, chromates, or other heavy metals. Fully recyclable and repulpable according to TAPPI Useful Method 253 (modified). Conforms to military specifications MIL-P-3420E. Protective film does not need to be removed prior to further surface finishing or coating application. Good moisture barrier and resistant to oils. Combines corrosion protection, barrier properties, and packaging into one step. Products should be packaged as soon after cleaning as possible. Keep the VpCI paper as close to the surface of the product as practical, leaving no barrier between the VpCI paper and the metal surface to be protected. Use approximately 1 square foot of VpCI paper for every 3 square feet of surface to be protected, and 1 square foot of VpCI paper for every 0.5 cubic foot of void space. For long-term storage of up to ten years, enclose the wrapped product in an airtight package. Standard construction of VpCI-144: Neutral natural paper coated on one side with the blend of water-barrier coating and VpCI material and with the barrier coating on the reverse side.